Hall Of Fame Nominations due July 1st. Stallion breeding reports are due in the MFTHBA office by January 15th, 2017. 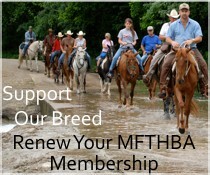 The report should list all mares bred to the stallion in 2016. https://mfthba.com/mfthba-forms/ There is no charge to file the report if received by the due date. Beginning February 1st there will be a $5 per month late filing fee. More products have been added to the Fox Trot store. Add the coupon code SAVE to your shopping cart for a 10% discount on your entire purchase! Sale ends Sunday evening.